On March 27th a group of 25 students of the Master in Water Management (MWM), a program designed by Aqua Development Network accredited by UPC, visited El Baix Llobregat WWTP and the sites of LIFE WIRE and aWARE project. This is the second visit organized within the framework of the MWM master in order to increase the technical knowledge of the participants on water treatment and management. The objective of the master program is to prepare young professionals to manage company business in the water and environment fields. The corporate program is designed to provide a general overview of the business and develop the management skills useful to efficiently manage the companies. The methodology of MWM combines lectures, virtual sessions and technical visits. One of the technical visits is being held at the Baix Llobregat WWTP, where the attendants learn how to manage this type of plants where wastewater reclamation is performed. The attendants also visit the prototypes and sites of LIFE WIRE and LIFE AWARE projects, that provides them with an overview on the last trends on water treatment technologies. 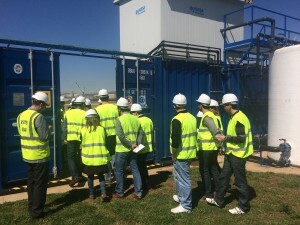 The next visit from a group of students to the Baix Llobregat WWTP and LIFE WIRE and aWARE sites is planned on April 24th.